PHOENIX, Oct. 27, 2016 /PRNewswire/ -- Republic Services, Inc. (NYSE: RSG) today reported net income of $85.6 million, or $0.25 per diluted share, for the three-months ended Sept. 30, 2016, versus $215.0 million, or $0.61 per diluted share, for the comparable 2015 period. Excluding certain expenses, on an adjusted basis, net income for the three-months ended Sept. 30, 2016, was $212.6 million, or $0.62 per diluted share, versus $184.7 million, or $0.53 per diluted share, for the comparable 2015 period. A majority of the expenses excluded from the 2016 adjusted EPS relate to the tender offer for certain outstanding bonds, which closed in early July. For the nine-months ended Sept. 30, 2016, net income was $423.1 million, or $1.23 per diluted share, versus $577.7 million, or $1.64 per diluted share, for the comparable 2015 period. On an adjusted basis, net income for the nine-months ended Sept. 30, 2016, was $569.4 million, or $1.65 per diluted share, versus $547.4 million, or $1.55 per diluted share, for the comparable 2015 period. "Our third-quarter performance underscores our ability to profitably grow our business, expand margins, increase earnings and free cash flow and efficiently return cash to our shareholders," said Donald W. Slager, president and chief executive officer. "Continued strength in our business and a favorable tax rate drove results that exceeded our expectations during the quarter. Given our solid results, we are updating our guidance to reflect our expected outperformance for the year." Third-quarter revenue growth from average yield was 2.1 percent and volumes increased 0.6 percent. Average yield improved sequentially overcoming a step-down in CPI-based pricing. Core price increased revenue by 3.2 percent, which consisted of 4.3 percent in the open market and 1.4 percent in the restricted portion of the business. Third-quarter adjusted diluted EPS was $0.62 per share, which exceeded the Company's expectations. Adjusted EBITDA margin was 28.9 percent of revenue, an improvement of 80 basis points from the prior year. Year-to-date cash provided by operating activities was approximately $1.4 billion and adjusted free cash flow was $576 million. During the third quarter we returned $212 million to our shareholders through share repurchases and dividends, and $622 million on a year-to-date basis. The Company completed a tender offer for certain outstanding bonds and issued new debt in early July that will save $17 million in annual interest expense. continued to increase the number of customers that do business with Republic digitally. Approximately 1.7 million customers are now enrolled in the MyResourceTM customer portal and mobile app. These tools significantly enhance customer interaction and connectivity. expanded ecommerce capabilities to include the small-container commercial business. Republic's customers can now purchase residential, small-container and temporary large-container services online. 18 percent of the fleet operates on natural gas, up from 16 percent in the prior year. 74 percent of the residential fleet is automated, up from 71 percent in the prior year. 90 percent of the fleet is certified under Republic's standardized maintenance program, up from 74 percent in the prior year. The entire fleet will be certified under the program by the second quarter of 2017. 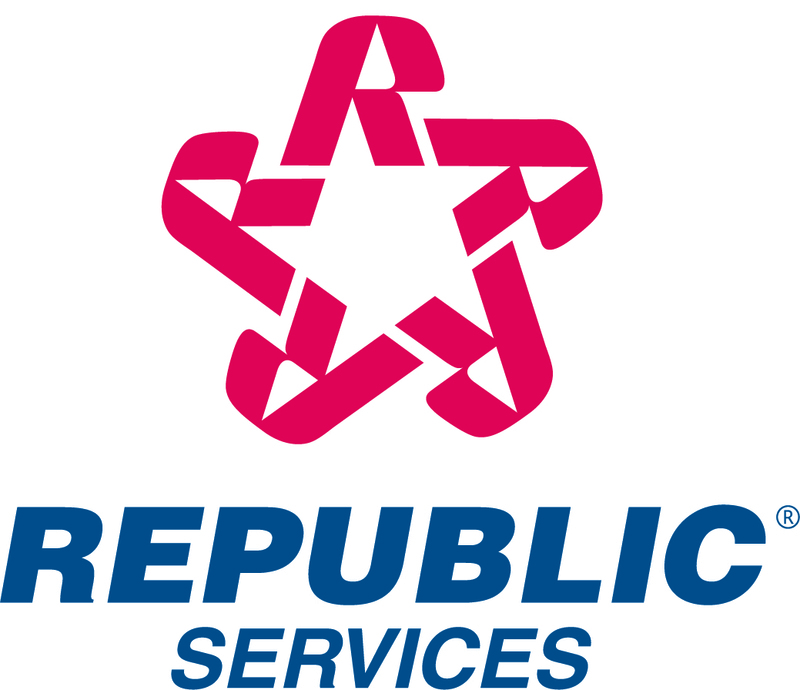 Republic made continued progress on the consolidation of its over 100 customer service locations and opened its third and final Customer Resource Center in Indianapolis. The state-of-the-art centers enhance the customer experience and will lower the Company's cost structure once the transition is complete by the end of 2017. The Company was named to the 2016 Dow Jones Sustainability World Index and North America Index. Republic was the only company in the solid waste industry to be named to both indices. Republic now expects its full-year adjusted diluted EPS to be in a range of $2.19 to $2.20, which is an increase from the original guidance of $2.13 to $2.17. Additionally, the Company expects full-year adjusted free cash flow to be in a range of $840 million to $850 million. The original adjusted free cash flow guidance range was $820 million to $840 million. Republic is providing preliminary outlook for 2017. This does not represent full detailed guidance, but rather a point-in-time estimate based on current projections of 2016 performance, early reviews of the 2017 budget process and current economic conditions. Consistent with prior practice, the Company will provide formal guidance in February 2017 once the budget process is complete and full-year 2016 results are reported. Adjusted diluted earnings per share is expected to be in a range of $2.31 to $2.36, which assumes an effective tax rate of 39.5 percent. Adjusted diluted earnings per share excludes the impact of restructuring charges. Adjusted free cash flow is expected to be in a range of $875 million to $900 million. Adjusted free cash flow consists of cash provided by operating activities, less property and equipment received, plus proceeds from the sale of property and equipment and is exclusive of cash paid for restructuring, net of tax. Mr. Slager commented, "We expect current trends to continue into 2017, positioning us well for mid- to high-single digit earnings and free cash flow growth." Republic announced today that its Board of Directors declared a regular quarterly dividend of $0.32 per share for shareholders of record on Jan. 3, 2017. The dividend will be paid on Jan. 16, 2017. Adjusted diluted earnings per share, adjusted net income, adjusted EBITDA, and adjusted free cash flow are described in the Reconciliation of Certain Non-GAAP Measures section of this press release. The adjusted diluted earnings per share and adjusted free cash flow related to the full-year guidance and the preliminary outlook are described in the 2016 Financial Guidance section and 2017 Preliminary Outlook section of this press release, respectively. Average yield is defined as revenue growth from the change in average price per unit of service, expressed as a percentage. Core price is defined as price increases to our customers and fees, excluding fuel recovery fees, net of price decreases to retain customers. We also measure changes in average yield and core price as a percentage of related-business revenue, defined as total revenue excluding recycled commodities and fuel recovery fees, to determine the effectiveness of our pricing strategies. Average yield as a percentage of related-business revenue was 2.3% and 2.2% for the three and nine months ended September 30, 2016, respectively, and 2.8% and 2.6% for the same periods in 2015, respectively. Core price as a percentage of related-business revenue was 3.5% and 3.7% for the three and nine months ended September 30, 2016, respectively, and 4.0% for each of the same periods in 2015. Reported diluted earnings per share were $0.25 and $1.23 for the three and nine months ended September 30, 2016, respectively, as compared to $0.61 and $1.64 for the same periods in 2015. During each of the three and nine months ended September 30, 2016 and 2015, we recorded a number of charges and other expenses and gains that impacted our EBITDA, pre-tax income, net income attributable to Republic Services, Inc. (net income – Republic) and diluted earnings per share. Line items in this column do not total to $0.42 per share due to rounding. As of September 30, 2016 and December 31, 2015, accounts receivable were $1,016.7 million and $962.9 million, net of allowance for doubtful accounts of $50.2 million and $46.7 million, respectively, resulting in days sales outstanding of 38, or 26 days net of deferred revenue, compared to 38, or 26 days net of deferred revenue, respectively. In July 2016, we paid a cash dividend of $102.8 million to shareholders of record as of July 1, 2016. As of September 30, 2016, we recorded a quarterly dividend payable of $109.0 million to shareholders of record at the close of business on October 3, 2016, which was paid on October 14, 2016. During the three months ended September 30, 2016, we repurchased 2.3 million shares of our stock for $109.6 million at a weighted average cost per share of $47.34. As of September 30, 2016, we had 340.8 million shares of common stock issued and outstanding. We believe that the presentation of an adjusted diluted earnings per share preliminary outlook, which excludes withdrawal costs - multiemployer pension funds, restructuring charges, loss on extinguishment of debt and gain/(loss) on disposition of assets and impairments, net, provides an understanding of operational activities before the financial impact of certain items. We use this measure, and believe investors will find it helpful, in understanding the ongoing performance of our operations separate from items that have a disproportionate impact on our results for a particular period. We have incurred comparable charges and costs in prior periods, and similar types of adjustments can reasonably be expected to be recorded in future periods. Our definition of adjusted diluted earnings per share guidance may not be comparable to similarly titled measures presented by other companies. With respect to the Company's preliminary outlook for adjusted free cash flow, a reconciliation to the closest corresponding GAAP financial measure is not available without unreasonable effort on a forward-looking basis due to low visibility that limits our ability to make accurate projections and estimates related to certain measures such as the purchase and sale of property and equipment, which could vary significantly, either individually or in the aggregate.